The Hopkins and Allen company was founded in 1868 by S. S. Hopkins, C. W. Hopkins and C. H. Allen. The company experienced financial difficulties and in 1898 was reorganized as the Hopkins & Allen Arms Co. A fire in 1900 hurt them and in 1901, they were forced to merged with the Forehand Arms Company. The manufacture of Hopkins and Allen firearms ceased in 1917 when the plant was taken over by Marlin-Rockwell Corporation for the war time production of Browning automatic rifle components. Hopkins and Allen was well known for the many models of inexpensive revolvers and shotguns. H&A used various trade names including Blue Jacket, Ranger, Dictator, Smoker, Kitemaug , Defender, Pioneer, Capt. Jack, Tramps Terror, Bang-Up, and Czar. All Hopkins & Allen Arms Co revolvers manufactured from 1902 until 1917 had serial numbers stamped into the bottom of the handle. Most H&A handguns were nickel plated, with blue finish originally costing $.50 extra, grips were hard rubber, wood or pearl. Some had engraving from low to very good quality. 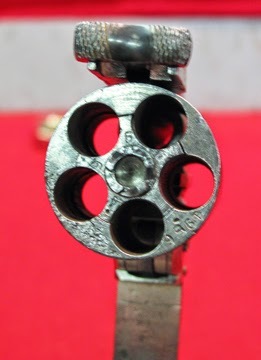 Revolver barrel lengths varied from 1 3/4-6 in. Calibers were .22 rimfire (.22 S, L, or LR) up to .38-40 WCF. Anyone know anything on this pistol. I just purchased it. Is it a Police Safety" model? Where can ammo be found for the 32 Cal?